The theoretical benefits of using antioxidant vitamin supplements to quench oxygen free radicals appear large. High intensity aerobic-type exercise produces oxygen free radicals that can cause damage to lipid membranes (lipid peroxidation) that may lead to many problems such as the inactivation of cell membrane enzymes, the progression of degenerative diseases (cardiovascular disease and cancer) and lessening of the effectiveness of the immune system. The major function of vitamin E is to work as a chain-breaking antioxidant in a fat soluble environment. Little research has examined lipid peroxidation associated with high intensity resistance exercise or possible protective effects of antioxidant supplementation or the effects of training state. There were no significant group (trained vs untrained) or treatment (vitamin E vs placebo) effects found between the 4 groups assessed. There was only one significant difference found and that was in the main effect for time (F = 22.41, p < 0.01). The Resistance Exercise Test caused a significant increase in malondialdehyde in all 4 groups at 6 hours post exercise. There was no evidence that vitamin E supplementation was effective in reducing oxidative damage in comparison to the placebo group. As well, there was no difference between the trained and untrained groups with respect to their impact on lipid peroxidation measures. Moderate to high intensity aerobic-type exercise produces oxygen free radicals that can cause damage to lipid membranes, proteins, deoxyribonucleic acid (DNA) and other cellular components [6, 16, 19]. The damage to lipid membranes, otherwise known as lipid peroxidation is defined as the oxidative deterioration of polyunsaturated fats in cellular lipid membranes caused by oxygen free radicals. The area of antioxidant supplementation and its ameliorating effects on exercise induced free radical damage (including lipid peroxidation) has attracted considerable interest in recent years. The theoretical benefits of using antioxidant vitamin supplements to quench oxygen free radicals appear large. The damage to lipids caused by the oxygen free radicals can result in many problems such as the inactivation of cell membrane enzymes, increased permeability of ions across membranes (decreased muscle cell functioning) and increased platelet aggregation in blood vessels. Other problems may include the progression of degenerative diseases (cardiovascular disease and cancer) and lessening of the effectiveness of the immune system [8, 9, 11, 27]. Two theories support the concept that resistance exercise could lead to an increase in the production of oxygen free radicals in active muscle sites. A widely held hypothesis involves the ischemia-reperfusion injury . Intense muscle contractions can result in a temporary decrease in blood flow and oxygen availability and subsequent ischemia. The following reperfusion period (muscle relaxation) produces an abundant reintroduction of O2 and results in the formation of the O2 - radical. Mechanical stress is another hypothesis used to explain an increase in free radicals. In particular, eccentric exercise causes high levels of force that has been shown to initiate muscle tissue damage. This initiates the inflammation process that eventually produces oxygen free radicals  and lipid peroxidation. Further research is required to support these hypotheses. Antioxidant supplementation may provide protection against the negative health consequences of oxygen free radicals caused by aerobic and resistance exercise. Vitamin E is probably the most focused upon and important non-enzymatic antioxidant substance in the body. Unlike most nutrients, a specific role for vitamin E in a required metabolic function has not been found . The major function of vitamin E is to work as a chain-breaking antioxidant in a fat soluble environment thus preventing the propagation of free radical reactions [3, 25]. Vitamin E is a lipid radical scavenger and especially protects polyunsaturated fatty acids (PUFA) within membrane phospholipids and in plasma lipoproteins . Lipid radicals react with vitamin E 1,000 times more rapidly than they do with PUFA . Vitamin E provides an easily donated hydrogen to the lipid reaction and an antioxidant radical is created . Then, the new antioxidant radical combines with other antioxidant radicals and becomes harmless or combines with ascorbic acid and is converted back to α tocopherol. Two studies involving vitamin E antioxidant supplementation and aerobic exercise have produced positive results [22, 30], while six other studies [12, 16–18, 21, 31] have produced 'no effect' results. The McBride et al. study has been the only resistance exercise study using vitamin E as an antioxidant. The results showed that vitamin E supplementation was ineffective in reducing resistance exercise induced lipid peroxidation. Additional research is required to support this conclusion. Opposing views have developed with regards to whether trained participants have increased protection against oxygen free radicals [16, 22, 31]. Researchers have explored antioxidant vitamins and enzymes that are found in blood plasma, in local tissue and within erythrocytes. Research performed in varying locations has caused conflicting results. 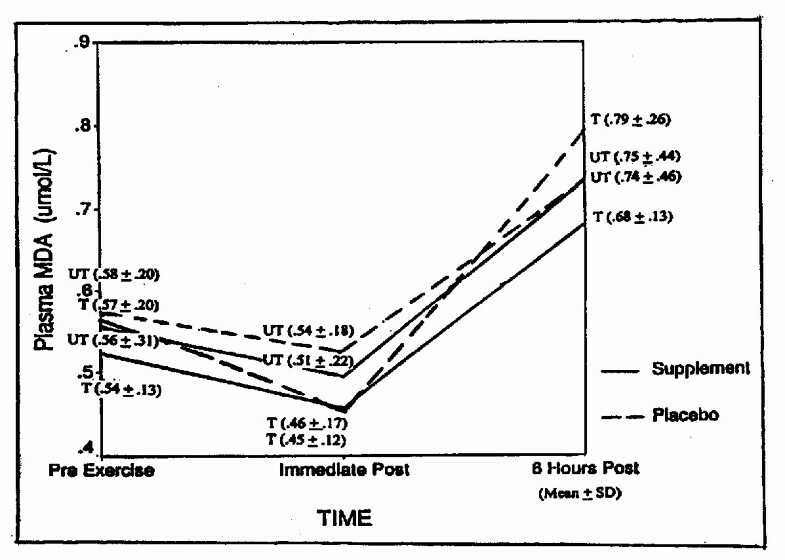 The primary objectives of the investigation were to determine: (1) whether a high intensity, whole body Resistance Exercise Test (RET) caused lipid peroxidation measures to significantly increase, (2) the effects of a 2 week period of antioxidant vitamin supplementation (Vitamin E) on the levels of lipid peroxidation measures caused by the RET, and (3) the impact that the training state (untrained vs trained) had on possible lipid peroxidation measures caused by the RET. In addition, the interaction of training state and antioxidant supplementation was investigated. Secondary purposes were to confirm whether a 2 week treatment period with vitamin E supplementation significantly increased blood plasma vitamin E levels and whether a 4 week washout period returned blood plasma vitamin E levels to baseline measures. The group descriptive measures (untrained vs trained) are noted in Table 1, while the weights lifted (10 repetition maximum RM) for each exercise during the resistance exercise test (RET) are listed in Table 2. * Body fat predicted from skinfolds using the Durnin and Womersley formula . All 27 participants were found to be in the normal range of plasma vitamin E levels (12 to 37 umol/L) before the study commenced . There were no significant differences between the untrained and trained groups with regards to the general descriptive measures taken except within the body fat percentage category and past resistance training experience category. The percentage of body fat was significantly higher in the untrained group (22.1 % ± 5.9) in comparison to the trained group (16.2 % ± 4.9) and as established by the enrolment criteria, the untrained group had greatly reduced experience in the weight room (0.1 year ± 0.1) in comparison to the trained group (5.2 years ± 2.6). There were significant differences found between the untrained and trained groups in weights lifted in all weight training exercises. The differences found between the untrained and trained groups in weights lifted was due to the substantial differences in past resistance training experience and lean body mass. The control variables that were used to ensure that the four groups (untrained placebo; untrained supplement; trained placebo; trained supplement) were consistent during the study included dietary vitamin E intake, dietary vitamin C intake, number of resistance training sessions, number of aerobic training sessions, and the rate of perceived exertion at the middle of the exercise test (RPE mid) and at the end of the exercise test (RPE end). A 2 group (trained vs untrained) × 2 treatment (placebo vs supplement) factorial ANOVA was performed on all 6 variable change scores (treatment period 1 to treatment period 2) separately and the results are presented in Table 3. All four groups had similar RPE mid and RPE end change score measures as indicated by the non significant status under the Overall F Statistic column. The two factorial ANOVA tests indicated that the four groups had exercised at an intensity level that did not change from one period to the next. There was no significant difference between the untrained group and the trained group (t25 = -.04, p = .96) for RPE mid and as well there was also no significant difference between the untrained group and the trained group (t25 = .70, p = .48) for RPE end. This indicates that the two groups (trained vs untrained) were exercising at similar relative intensities. All four groups had similar change score values (treatment period 1 to treatment period 2) for the number of resistance workouts (F (3,23) = .14, p = .93) and aerobic workouts (F (3,23) = .38, p = .76). Therefore, there was no change in their workout patterns during the length of the study. The dietary vitamin C intake results showed no statistical differences (F (3,23) = .12, p = .95) between the four groups. Therefore, there were similar changes in the four groups. There were no significant differences in the dietary vitamin E intake change scores between the four groups (F (3,23) = 1.2, p = .33). Overall, we see that there were no significant differences within the 4 groups in the 6 control variables selected. These 6 potential confounding variables were monitored to ensure that they did not compromise the results of the study. The 27 participants had a two week period of vitamin E supplementation (885 mg tocopherol/day – SU) and a two week period of placebo (soy bean oil capsule – PL) separated by the 4 week washout. 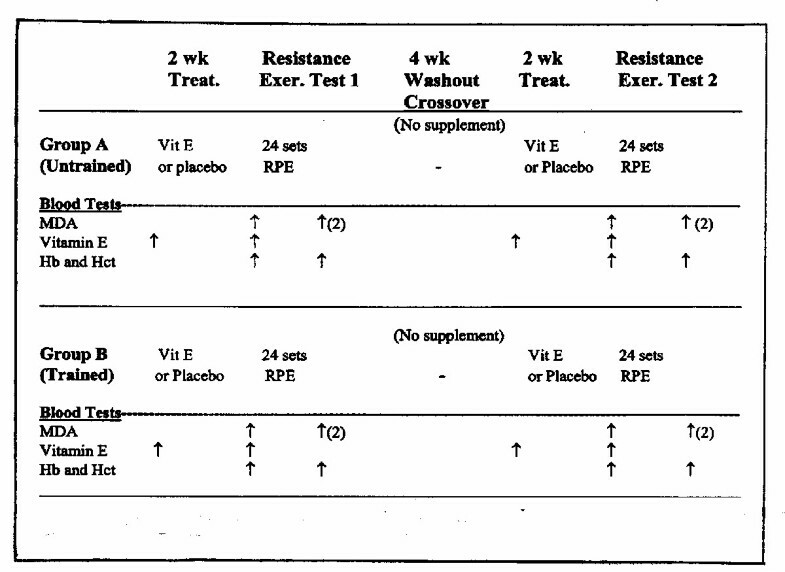 In studies with crossover designs (see Figure 1), it is necessary to test for a carryover effect, i.e., to see if the supplemental vitamin E (or placebo) was transferred from the first treatment period to the second treatment period [10, 1, 32]. An independent t-test was performed between the two groups (PL/SU; SU/PL) on plasma vitamin E change scores (pre to post treatment) (t22 = 0.49, p = .62). The test did not provide evidence of a 'treatment by period' interaction. This test showed that there was no significant difference between the two groups and therefore the data from the two treatment periods was pooled. Experimental Design. Legend: Vit E = vitamin E; RPE = rate of perceived exertion; MDA = malondialdehyde; Hb = haemoglobin; Hct = Hematocrit; 2 week treat. = 2 weeks of treatment; χ = crossover of treatment; ↑ = time of measurement. The two dependent variables that were assessed included plasma vitamin E and malondialdehyde (MDA). Plasma vitamin E was evaluated to determine the effectiveness of vitamin E supplementation. Malondialdehyde was assessed to determine if it significantly increased as a result of the RET. Secondly, MDA values were also analyzed to see whether post exercise MDA measures were influenced by the vitamin E supplementation or the state of training of the participant. A 2 treatment (supplement vs placebo) × 2 group (untrained vs trained) factorial ANOVA was performed on plasma vitamin E change scores (pre to post treatment) (F (3,42) = 16.94, p < .01). There was a significant difference found in the main effect for treatment (F (3,42) = 46.50, p < .01, as the two supplemented groups had large increases (almost double) in their plasma vitamin E levels, while the two placebo groups had very small plasma vitamin E changes. There was no significant difference found for the main effect for group (F (3,42) = 3.19, p = .08), plus no significant difference found for the treatment by group interaction (F (3,42) = 3.74, p = .06). 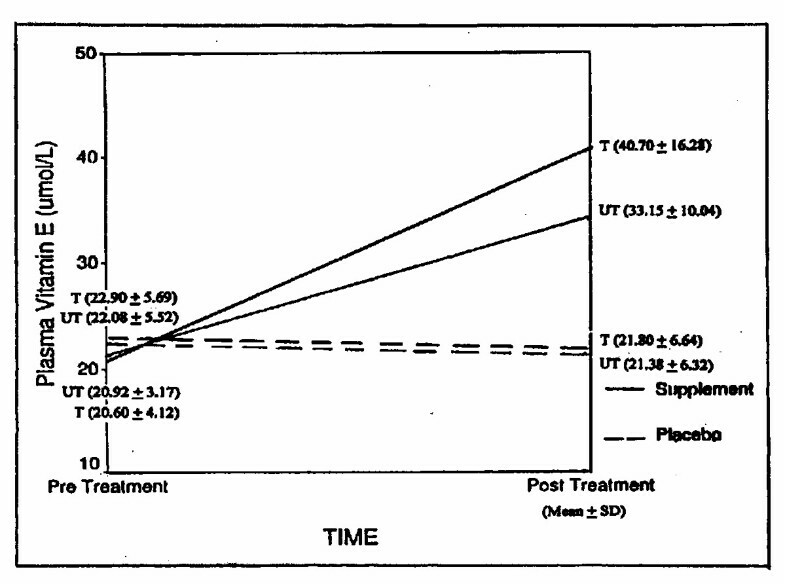 Figure 2 shows the changes in plasma vitamin E as a result of the vitamin E and placebo treatments. A 2 group (trained vs untrained) × 2 treatment (vitamin E vs placebo) × 3 time (pre exercise vs immediate post exercise vs 6 hours post exercise) factorial ANOVA with repeated measures on time was performed on MDA values. There were no significant differences found in the main effect for group or main effect for treatment between the four groups (untrained/placebo; untrained/supplement; trained/placebo; trained/supplement) assessed. There was only one significant difference found and that was in the main effect for time (Wilks' Λ = .52, F (2,49) = 22.41, p < .01). Using the Pairwise Comparison Post Hoc test for the main effect for time, it was found that the 6 hour post exercise MDA values were significantly higher in comparison to the pre exercise MDA levels (t53 = - 4.15, p < .01). Therefore, the RET did cause a significant increase in MDA and lipid peroxidation. Immediate post exercise MDA values were significantly lower than pre exercise MDA levels (t53 = 2.52, p = .02) and the 6 hour post exercise MDA values were significantly higher than the immediate post exercise MDA values (t53 = - 6.56, p < .01). Figure 3 displays the MDA measures from pre to immediate post exercise and 6 hours post exercise for the four groups. In summary, there was no evidence that vitamin E supplementation was effective in reducing oxidative damage in comparison to the placebo group. As well, there was no difference between the trained and untrained groups with respect to their impact on lipid peroxidation. Two results followed an expected pattern – a high intensity resistance exercise bout resulted in significant increases in lipid peroxidation and vitamin E supplementation was able to significantly increase the levels of plasma vitamin E in participants. The end result of the study showed that the two weeks of vitamin E supplementation (885 mg/day α tocopherol acetate) did not attenuate resistance exercise induced lipid peroxidation in both untrained or trained resistance participants. If the assumption is correct that acute measures of increased levels of lipid peroxidation contribute to long term negative health consequences, then the implications of this research would indicate that vitamin E antioxidant supplementation does not combat the negative health consequences. Also, the trained participant had no added protection against free radical damage if exposed to the same relative intensity of exercise. One of the purposes of this study was to explore the effects of a high intensity resistance exercise test on lipid peroxidation levels. Maughan et al. state that peak changes in MDA occur at 6 hours post exercise, while some studies have only examined immediate post exercise MDA values. The current study found a significant decrease in MDA immediate post exercise in both groups (supplemented and placebo); nevertheless, the key measurement to utilize is the measure occurring at the peak time of MDA at 6 hours post exercise. The significant increase in MDA (at 6 hours post exercise) agrees with the majority of research in the field of aerobic exercise and as well the McBride et al. high intensity resistance exercise study. In the current study, the supplementation treatment was successful. It was found that plasma vitamin E levels significantly increased with the supplementation of 885 mg/day of vitamin E for 14 days. Nevertheless, vitamin E supplementation was not able to decrease the lipid peroxidation caused by intense resistance exercise. Other studies [16, 21, 31] have also shown that vitamin E supplementation was not effective in reducing lipid peroxidation, although these studies used aerobic exercise as the mode of exercise. The reason for the 'no effect' of vitamin E supplementation in the current resistance exercise study is not clear. This study controlled for many outside confounding variables that might have affected the results. Plus, the plasma vitamin E levels were significantly increased in the supplemented group due to the treatment. The results presented in this review are in conflict with the theoretical construct supporting vitamin E antioxidant supplementation outlined in the introduction. One potential reason explaining the ineffectiveness of vitamin E supplementation is that perhaps there were too many oxygen free radicals at the specific muscle tissue site (due to intense exercise) and the localized vitamin E was not sufficient enough to quench the overload. Perhaps the transfer of vitamin E from the blood plasma was not quick enough. The rate of O2 flux into the working muscle may increase 100 fold during intense exercise . This can result in a 4 to 5 percent increase in the superoxide radical (O2 -) . Perhaps, this is too much for the current levels of vitamin E in muscle tissue to handle. Further investigation is necessary at the muscle tissue site to provide more specific information with regards to the amount of vitamin E present and what quantity is being used locally to quench oxygen free radicals. The creation of higher levels of vitamin E in human plasma may be an ineffective method to combat exercise induced free radicals. This was the first study to explore the training state (untrained vs trained) in resistance participants to determine if the level of training had an impact on the amount of free radical damage. As expected, trained individuals could lift heavier weights, but as long as relative intensity was kept constant (i.e. RPE), there was no difference between trained and untrained participants in terms of post exercise MDA production. If one were to reconsider the mechanical stress and muscle damage theory outlined in the introduction, one might infer that the MDA production was a function of muscle damage, not absolute muscle work. However, if the second hypothesis (ischemia-reperfusion theory) were reviewed, a more intense and larger muscle contraction from a trained participant would produce a greater, temporary decrease in blood flow and oxygen availability and subsequent ischemia. The following reperfusion would produce a larger reintroduction of O2 and result in a greater formation of the O2 - radical. Subsequently a more developed antioxidant mechanism would be necessary to combat the larger amount of free radicals. In summary, this study showed that 1) a high intensity resistance exercise bout resulted in significant increases in lipid peroxidation, 2) two weeks of vitamin E supplementation (885 mg/day α tocopherol acetate) offers no protection against resistance exercise induced lipid peroxidation and 3) training allows greater work output, but at the same relative intensity, trained and untrained participants can expect similar MDA production. Further investigation is necessary at the muscle tissue site to provide more specific information with regards to the amount of vitamin E present and what quantity is being used locally to quench oxygen free radicals. Many of the endogenous antioxidant enzymes and vitamins should be monitored during research. This would provide a detailed picture of the changes that occur as a result of chronic training or an acute exercise bout. Most studies have failed to observe the complete picture. Females and males should be utilized as participants. Not enough research has been done with females as participants. For example, lower amounts of exercise induced lipid peroxidation may be produced in the female body due to increased antioxidant properties as a result of elevated estrogens levels. Further investigations are required in the area of the trained versus untrained participant. There seems to be some support for long term training producing positive adaptations in the antioxidant composition in the human body. Twenty seven males and females between the ages of 19 and 30 years of age volunteered for this investigation. All participants were required to meet one of the group criteria. Fourteen participants (m = 7, f = 7) were placed in the untrained group and 13 participants (m = 8, f = 5) were enlisted in the trained group. The trained group consisted of individuals who had been doing resistance training for a minimum of 3 years to a maximum of 10 years and who were currently doing weight training regularly (3 to 5/ week). The untrained group was composed of individuals who had very little resistance training experience (under 6 months). The participant characteristics are outlined in Table 1. The participants took part in a double blind, placebo controlled crossover experimental design study. Participants were randomly assigned to receive either the 885 mg tocopherol acetate/day or placebo during the first 2 week period. This was followed by a 4 week washout period and then a reversal of treatments during the last 2 week period (see Figure 1. in Results Section). At the end of each treatment period the participants performed the Resistance Exercise Test (RET). Individual 3-day diet diaries were filled out and analyzed during Treatment Period #1 and Treatment Period #2 for all participants to quantify average vitamin E and vitamin C intakes for the 4 treatment groups (untrained/placebo; untrained/supplemented; trained/placebo; trained/supplemented). The participants were required to maintain their exercise habits they were accustomed to throughout the 8 week study. Daily logs were kept by each participant throughout the study that included a record of their exercise sessions, injuries or illnesses and major stress incidents. Participants were not allowed to exercise 24 hours prior to the RET and up to 6 hours post RET. The RET consisted of exercise performed in a circuit type fashion that consisted of 8 exercises. The exercises included the bench press, incline leg press, side lateral raises, leg curls, arm curls, leg extension, lat pull downs and abdominal curls. This means that one set was performed on each exercise, then the next exercise was performed until the circuit of 8 exercises was completed. A total of 3 circuits were performed with 2 minute rest periods between circuits and 1 minute and 30 seconds rest periods between each set. Each participant lifted weights at their own 10 repetition maximum (10 RM). This ensured that each participant was lifting at a similar intensity in relation to their strength. Each individual's 10 RM for each exercise was predetermined 1–2 weeks prior to the commencement of the first treatment period. Also, a warm up circuit consisting of sets of 10 repetitions was performed at the beginning of the RET using 75 % of the individual's 10 RM. Blood samples were obtained 5 minutes before the RET, immediately post exercise and 6 hours post exercise. The timing of the blood sampling for various measures is outlined in Figure 1. Eight blood samples were taken from each participant during the study. The amount of blood withdrawn was small (20 ml) and it was obtained by a certified phlebotomist from an antecubital vein using vacutainers®. The first blood sample was taken immediately before each RET to determine blood plasma vitamin E levels  after Treatment Period #1 and Treatment Period #2. Blood samples were also taken and analyzed for Malondialdehyde (MDA) levels. They were taken before each RET, immediately after each RET and 6 hr post RET. The method of Chirico  was used to determine lipid peroxidation (levels of MDA) using the modified TBA test with BHT added. Hematocrit (Hct) and Haemoglobin (Hb) were also measured (pre and immediate post RET) and plasma volume shifts were determined using the equation suggested by Van Beaumont et al., . The control variables that were used to ensure that the four groups (untrained placebo; untrained supplement; trained placebo; trained supplement) were consistent during the study included dietary vitamin E intake, dietary vitamin C intake, the number of resistance training sessions, the number of aerobic training sessions, RPE middle and RPE end. A 2 group × 2 treatment factorial ANOVA was performed separately on each of the control variable change scores (treatment period 1 to treatment period 2). The two dependent variables that were assessed included plasma vitamin E and Malondialdehyde (MDA). To determine the changes in plasma vitamin E as a result of the vitamin E and placebo treatments, a 2 treatment (supplement vs placebo) × 2 group (untrained vs trained) factorial ANOVA was performed on plasma vitamin E change scores (pre to post treatment). To evaluate the changes in MDA, a 2 group (trained vs untrained) × 2 treatment (vitamin E vs placebo) × 3 time (pre exercise vs immediate post vs 6 hours post exercise) factorial ANOVA with repeated measures on time was performed on MDA values.